Turmeric is the dried rhizome of Curcuma longa, a herbaceous plant. The rhizome has 1.8-5.4% curcumin, the pigment and 2.5-7.2% of essential oil. It is used as an important condiment and as a dye with varied applications in drug and cosmetic industries. In India, Andhra Pradesh is the leading state followed by Maharashtra, Tamil Nadu, Orissa, Kerala and Bihar. Turmeric can be grown from sea level to 1500m in the hills, at a temperature range of 20-300C with a rainfall of 1500-2250mm per annum. It is also grown as an irrigated crop. It thrives best in a well drained sandy or clayey loam rich in humus content. It can be grown on different soil viz. light black, ashy loam and red soils to clay loams. CO1, BSR.1, Suguna, Suvarna, Sudharshana, Krishna, Sugundham, Roma, Suroma, Rajendra Sonia, Ranga, Rasmi. The areas where the rainfall is sufficiently early, crop can be planted during April-May with the receipt of pre-monsoon showers. Since turmeric is a shade loving plant, castor or Sesbania grandiflora may be raised along the border lines in the field. Well developed healthy and disease free whole or split mother rhizomes weighing 35-44g are used for planting. Rhizomes are treated with 0.3% Dithane M-45 and 0.5% Malathion for 30 minutes before storing. Small pits are made with a hand hoe in the beds in rows with a spacing of 25x 30 cm and covered with soil or dry powdered cattle manure. The optimum spacing in furrows and ridges is about 45-60 cm between the rows and 25 cm between the plants. A seed rate of 2500kg of rhizomes are required for one hectare. Farm yard manure @10 t/ha is applied as basal dressing. Beds are earthed up each time after top dressing. The NPK recommendation is 125:37:37kg per ha. Whole Phosphorus (P) and Potash (K2O) is given as basal dose at the time planting while Nitrogen (N) is applied as 25kg each at basal, 30,60,90 and 120 days after planting i.e., 125kg N.
The crop is to be mulched immediately after planting with green leaves or banana psuedostem or sugarcane trash at the rate of 12-15 tonnes per hectare. It may be repeated for second time after 50 days with the same quantity of green leaves after weeding and application of fertilizers. Weeding may be done thrice at 60,120and 150 days after planting depending upon weed intensity. Depending on the soil types, irrigated crops require 15-20 irrigations in heavy soils and 35-40 in light soils. Moisture stress affects the growth and development of the plant especially during the rhizome bulking stage. Shoot borer (Conogethes punctiferalis)The presence of bore hole on the pseudostems through which the frass is extruded and the withered central shoot are the symptoms of pest infestation. Spray Malathion 0.1% at monthly interval from July to October. They feed on the plant sap and in the field in severe cases plants wither and dry. In storage the pest infestation results in shrivelling of buds an rhizomes and may also affect the sprouting of rhizomes. Dip the rhizomes in quinalphos 0.1% twice prior to storage and sowing. Collar region of the pseudostems become soft and water soaked, and the plant collapses. Drench the soil with 0.3% Dithane M-45. Dip rhizomes in the same chemical solution for 30 minutes before storage and at the time of sowing. There are small, oval, rectangular or irregular brown spots on either side of the leaves. The leaves turn yellow. Apply to soil aldicarb or carbofuran granules at 1kg a.i/ha. Depending upon the variety, the crop becomes ready for harvest in seven to nine months. The land is ploughed and the rhizomes are gathered by hand picking or the clumps are carefully lifted with a spade. Harvested rhizomes are cleaned of mud and other extraneous matter adhering to them. The average yield per hectare is 20-25 tonnes of green turmeric. The fresh turmeric is cured before marketing. Curing involves boiling of fresh rhizomes in water and drying in the sun. The mother rhizomes and the fingers are generally cured separately In the traditional method, the cleaned rhizomes are boiled in copper or galvanized iron or earthen vessels, with water just enough to soak them. Boiling is stopped when froth comes out and white fumes appear giving out a typical odour. The boiling lasts for 45-60 minutes when the rhizomes are soft. In the improved scientific method of curing the cleaned fingers (approximately 50kg) are taken in a perforated trough of size 0.9 X 0.55x0.4m, made of GI or MS sheet with extended parallel handle. The perforated trough containing the lingers are then immersed in the pan. The alkaline solution (0.1% sodium carbonate or sodium bicarbonate) is poured into the trough to immerse the turmeric fingers. The whole mass is boiled till the fingers become soft. The cooked fingers are taken out of the pan by lifting the trough and draining the solution into the pan. The cooking of turmeric is to be done within two to three days after harvesting. The cooked fingers are dried in the sun by spreading 5-7 cm thick layers on bamboo mat or drying floor. During night time, the materials should be heaped or covered. Drying is completed in 10-15 days. The appearance is improved by smoothening and polishing outer surface by manual or mechanical rubbing. The improved method is by using hand operated barrel or drum mounted on a central axis, the sides of which are made of expanded metal mesh. When the drum filled with turmeric is rotated at 30 rpm, polishing is effected by abrasion of the surface against the mesh as well as by mutual rubbing against each other as they roll inside the drum. The turmeric is also polished in power-operated drums. 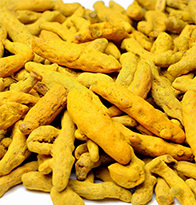 The yield of polished turmeric from the raw materials varies from 15-25%. In order to impart attractive yellow colour, turmeric suspension in water is added to the polishing drum in the last 10 minutes. Composition of emulsion for colour coating of 100kg of half boiled turmeric is Alum 0.04kg, turmeric powder 2kg, castor seed oil 0.14kg, sodium bisulphate 30g, concentrated hydrochloric acid 30ml. When the rhizomes are uniformly coated with suspension, they may be dried in the sun.